raw and cooked vegetable, mixed salad or made ​​ointment. Fresh cabbage contains water, protein, fat, carbohydrates, fiber, calcium, fsfor, iron, sodium, potassium, vitamins A, C, E, thiamine, riblovavin, nicotinamide, calcium and beta carotene. It also contains compounds sianohidroksibutena (CHB), sulforafan and iberin that stimulates the formation of glutathione, an enzyme that works by breaking and removing toxic substances circulating in the body. 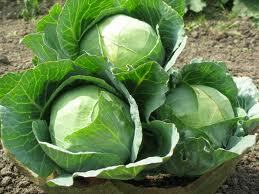 The high content of vitamin C the 'cabbage' can prevent the onset of skorbut (scury). The existence of substance anthocyanins cause the color of 'cabbage' can turn into red. Sulforafan and histidine can inhibit tumor growth, prevent colon cancer and rektun, detoksikasi dangerous chemical compounds, such as cobalt, nickel and copper excess in the body, and increase endurance to fight cancer. Sulfur amino acid content is also efficacious in lowering high cholesterol levels, nerve calming and uplifting. Parts used are the leaves. Constipation: eat fresh vegetable 'cabbage' every day, either raw or cooked.